Damn it to hell, this one hit hard. 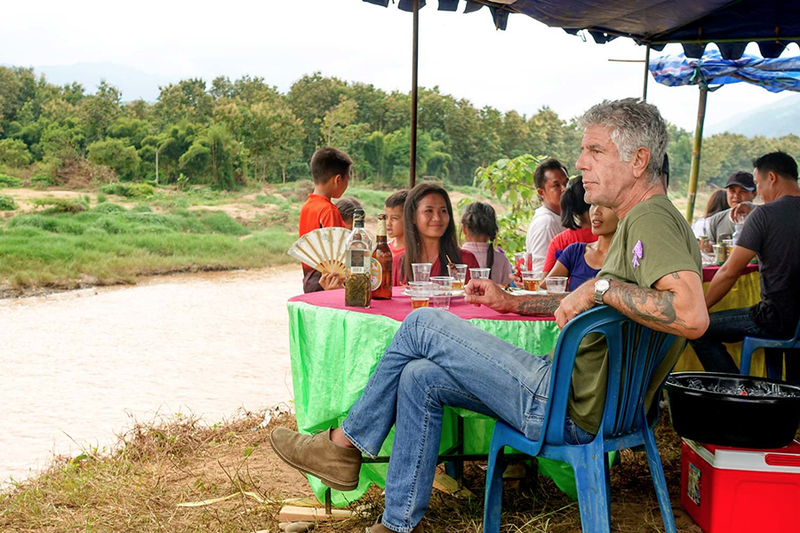 The news of Anthony Bourdain’s passing — the second high-profile death by suicide this week—seemed to rally every Hadean circle of Twitter into a relentless but cathartic act of communal mourning on Friday. Competitive Grief Twitter, our tone-deaf tendency to take a celebrity’s death and find a tangential way to Make It About Me, can get exhausting. (“RIP, Heath Ledger — I totally lost my virginity to 10 Things I Hate About You!”) But today felt different: It seemed like everyone, from celebrity to nobody, had a doozy of a Bourdain story to share—a seemingly everyday occurrence of compassion and generosity you might not expect from a former heroin addict with a face so craggy you could hide a scarf in it. And there was no shortage of great Bourdain moments brought to light: his gut-bustingly funny roast of Guy Fieri, his nuanced take on the hypocrisy of anti-Mexican racism, his support of octogenarian food reviewer Marilyn Hagerty and his thrashing of the James Beard Foundation, to name a few. Perhaps it should come as no surprise that Bourdain—a guy whose warm rapport with global strangers of all walks of life defined his success onscreen and whose considerate support for the #MeToo movement put him back in the public eye this past year—would leave so many people with something to share. But I don’t think I realized what a mensch this Tony guy really was. Even Obama, who shared a meal with Bourdain in Vietnam. Journalist Yashar Ali threaded a story about how his texts with Bourdain helped him through a bout of depression. He also wrote about Bourdain’s support of girlfriend Asia Argento amid the Harvey Weinstein media storm. 4. While many people, including reporters, had moved on from the Weinstein saga he wanted to make sure there was justice. He texted me repeatedly with ideas and every time a Weinstein survivor was attacked he would let me know because he was determined to stop Harvey's machine. I love this thread, by filmmaker Jonah Ray Rodrigues, who made a parody of Parts Unknown and got Bourdain to play a “shittier, more buffoonish” version of himself. The clip is a must-watch. He was just so giving with his time and energy. He was funny. We talked about the Stooges. He improvised a ton of great jokes. He was just as solid as you wanted him to be. I felt he had a lot more he was going to accomplish before the end. He was such a great artist. Xi’an Famous Foods CEO Jason Wang wrote about meeting Bourdain as a college student, when his now-beloved NYC restaurant was a “basement food stall” in Flushing, Queens. Fiction writer Laura Lippman has an incredible story about how her husband, The Wire creator David Simon, developed a bro crush on Bourdain and clowned on him for being “the most incompetent heroin addict that ever lived” when he admitted he couldn’t score dope in Baltimore. A few weeks ago, when we lost Roth, I joked about the Bourdain stories I would tell one day, adding that I hoped it would be 50 years hence. Well, here we are. So, anyway, that’s the man I knew, very slightly. Someone you could tease about his heroin addiction, someone that my husband wanted a bromance with, a guy who wanted to hold a baby girl in his lap while tolerating a fancy restaurant. Bourdain gave a kid with leukemia an incredible gastronomical tour through Spain, wrote Evan Benn of the Miami Herald. What’s more, he took zero credit for it. Bourdain once struck up a conversation with illustrator Shivana Sookdeo in line at a food festival, she wrote. She told him about her parents’ home country, Trinidad and Tobago. Then Bourdain actually filmed there, and she recalled how marvelous it was to watch him. I think many of us trusted him to do that, to fall in love with the places we came from and to understand why we lived there or why we left there. We trusted him to see us as people first. Not curiosities. And also, let’s remember how much the guy absolutely hated Henry Kissinger. This story rules too.